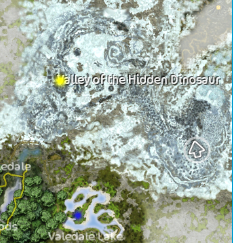 There is one hidden quest in Dino Valley, located in the Valley of the Frozen Mist. It is in a slightly different location for everyone, but is in the same approximate area. I found it at coordinates [388,88]. The quest character is a frozen veterinarian leaning stiff up against a tree. Objectives: Ride over to Nic’s camp with the frozen vet. Pick up the vet and return to Nic’s camp with your new frozen charge. Oh, look, it’s the vet… Doctor… Umm, Doctor… Who? I really can’t remember your name. Like I said, biology isn’t my strongest point. What’s that Rita? Do I know her? Mm, not exactly, but she was a passenger in the helicopter with me when we crashed. We didn’t have anything to talk about so I obviously didn’t think about her. Return to Professor Einstein tomorrow. Huh? Oh… Hello Rita. What can I do for you? You wonder what happened to the vet? I haven’t watched that closely, but I thought I heard some kind of mumbling and groaning from over by the fire. It’s most likely the sound of your veterinarian beginning to defrost, I suppose. Go on and take a look, I must continue with my calculations here. Objectives: Talk to the frozen vet. Speak to the vet who has been left by the fire to defrost. Oh, thank you so much for all your help! What’s your name? Rita. Well, thank you Rita. I’ve been wandering around this frozen wilderness for so long that I’d almost given up hope. Well, I thought I’d try to do a little research on the very unusual horses I’ve heard live here. I read about them in some kind of antique book and thought finding them again could be the discovery of the year, but now I’m not so sure if I’m able to carry on looking for them. I’ve had quite enough adventure for now… Listen, do you think there might be place for a veterinary practice here? Objectives: Talk to the vet. Tell the vet where she can set up her practice in the camp. You think there’d be demand for a vet here? Excellent! I’d like to stay here, so I’m around if Icerunner needs my attention sometime. You can now visit the vet to care for your horse just like any of the other vets in Jorvik. Thank you so much for all of this info!! It is so helpful! Speak to Clementine in the cafe to complete this quest. The chocolate hearts are beside Clementine on the counter top. Give them to the janitor. It is at the mall. You will need to do the first couple quests to get a bus ticket from james.